It’s not just a RC car, it can be programmed to be self-driving follow a set of instructions or even be controlled from a remote computer, and it can be used via game controllers and custom joysticks like a remote control car. Designing your own product or prototype is loads of fun, but it become more complicated when you decided to make it in a live size scale. So I choose Google Sketch-up 2017 as powerful and easy designing tool and it allows you export the blueprints of your model to a laser cut machine or even 3D printer. I spent the first three weeks designing and constructing the hull of the robot. As for materials, I was given a sheet of 3mm Wooden board. The not-so-nice final wiring of the robot, which, because of time constraints, consisted of stuffing the entire roadkill into the hull. I thought an apt name for my robot was M1Rover. Because I’m planning to develop a versions of it in a sequence names like M2, M3, etc. It designed in a Kit, all you have to do is to assembly it with some screws. ⦁ Up to three hours runtime! ⦁ Designed for the Arduino Uno, Mega and Nano. H-Bridge's are typically used in controlling motors speed and direction, but can be used for other projects such as driving the brightness of certain lighting projects such as high powered LED arrays. 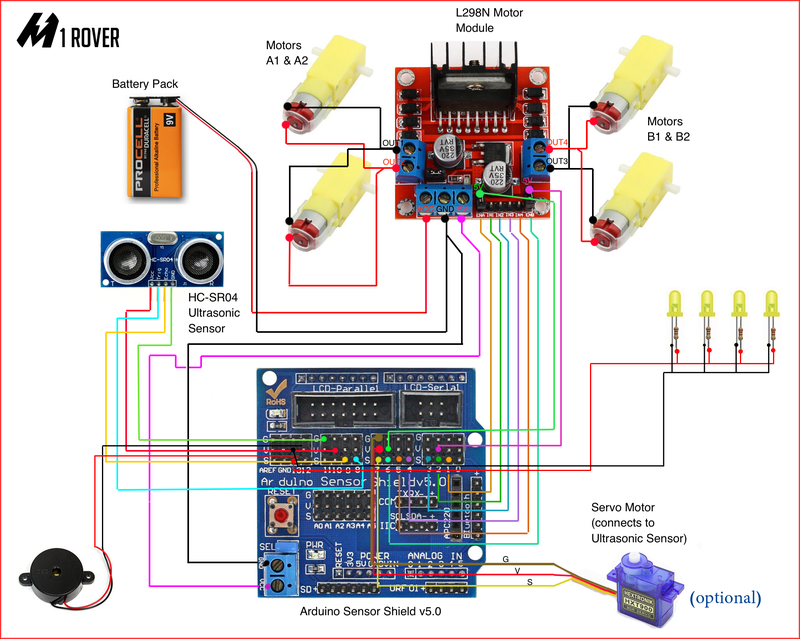 ⦁ Make sure you have all of your grounds tied together; Arduino, Power source, and the Motor controller. ⦁ The PWM Pins are unnecessary if you do not want to control PWM features. Chassis has been cut using laser cutter in a few parts, and as I mentioned before the model was created in a kit easy to assembly, so all you have to do is to follow the instructions below. Circuit was little bit tricky because when you decided to control many electronic parts at the same time you should take care about the sequence of each part. I considered amount of things while writing the code of M1-Robot, and with GUI software you are able to get more information about robot status. else if (bt == 'S')     //stop!! The Arduino code is compatible with any kind of controllers because all the electronic parts are programmed to work through serial port orders, so you may use Bluetooth module sender/receiver, PC, cell phone. This M1-Robot package entails basic components while the top plate allows for easy mounting of any sensing, manipulation or computer hardware. Simply attach sensors to the onboard and Rover power supplies to get started. The Explorer package enables basic indoor and outdoor autonomous functionality, and instead of IP camera I used a mobile phone cam connected to the internet via IP address. The Explorer package enables basic GPS tracking, of course, while the vehicle is outdoor, it’s very cool when you watching the coordinates paths in the real-time. Interacting with the world with a robot arm and a two-finger 50mm gripper. Not all servos have a full 180 degrees of rotation. Many do not. You can write a test to determine where the mechanical limits are. Use servo.writeMicroseconds instead of servo.write I like this better because it lets you use 1000-2000 as the base range. And many servos will support outside that range, from 600 to 2400. Edit: I should say that if you want, you can set the min and max microseconds in the attach, then simply use servo.write. It uses map() to change the 0-180 degrees value you pass into a microseconds value. It soon will be if you keep it at the end stop - it is pulling high current and heating up rapidly - its all too easy to "cook" a servo by loading it this way for any length of time. High qualified software engineer, Creativity and Technology have always been a big part of my life.